In today’s world, dental implants are the premier treatment solution for most patients who’ve lost parts of their natural smiles. They’re exceptional in that they rebuild the entire structure of a natural tooth, not just the white crown that sits atop the gum line. The final result is highly durable, seamlessly attractive, and built to last for several decades or even the rest of a person’s life. At Morgan-Hill Dental Care, we’re happy to offer comprehensive implant care right here in our dental office! Contact us today to schedule an initial consultation or if you have any questions. 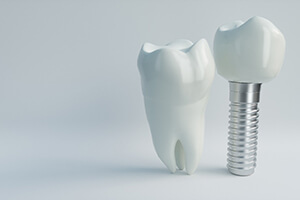 Why Choose Morgan-Hill Dental Care for Dental Implants? Before getting started with your tooth replacement plan, we will carefully review every step of the dental implant restoration process. This ensures you’ll feel 100% confident before we get started with this complex tooth replacement process. Your treatment plan will be completed over the course of several phase of treatment. We’ll start with a tooth replacement consultation. Then, we’ll perform any preparatory procedures before placing your dental implant posts. Then, we’ll design and craft your replacement tooth or teeth, leaving you with a flawless smile. 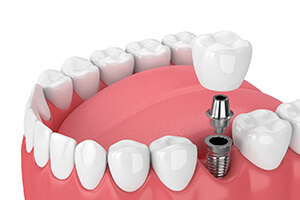 Dental implants offer many benefits to anyone missing a single tooth or several teeth. One thing on many people’s list of concerns is how others may view the dental implant. That is not a problem though. Because of advances in the aesthetics of dentures, the implants look just like natural, normal teeth. The implants are embedded directly into the gum and jaw giving the appearance of a natural, healthy tooth. Comfort is another concern people have when undergoing any dental changes. When thinking of dentures and bridges, there is usually a bulky base included. Implants do not require a base of any kind. The dental implant is embedded directly into the gum and jaw giving the appearance and feel of a natural tooth. Dental implants are comfortable and natural. You will forget that the implant is not your original tooth. Another issue that not everyone thinks about when missing a tooth or several teeth, is how this affects the jaw bone. By using a bridge or dentures to replace teeth, your jawbone is not getting the support it needs. Dental implants do provide a solid support for your bone structure. The dental implants help maintain the integrity of your jawbone and stop the bone structure from dissolving. Implants also stop your remaining teeth from shifting. Dental implants are created to last a lifetime. If you find yourself with one or several missing teeth, consider getting dental implants. The reason for the missing teeth makes no difference in this situation. Whether the tooth or teeth have been lost because of decay, injury, or gum disease does not change the effectiveness of dental implants. We have patients that have dealt with each of these conditions but now have their natural teeth restored, giving them the confidence to smile, laugh, and eat in public. When faced with individual missing teeth, all-ceramic dental crowns are the best method available for conservative and confident restoration. They can be placed between natural teeth without any major alterations needed, and the final result is so seamless that patients will likely find it difficult to point out the false tooth after some time has passed. Crowns are also a viable option when restoring several teeth throughout the mouth, but cases where one or more teeth that used to appear in a row have been lost are better suited to implant-retained dental bridges. Like the name implies, this modern style of prosthetic “bridges” gaps by anchoring into place over two dental implants – one on either side. The final result is very sturdy and functional while still providing excellent aesthetic quality. Implant-retained dentures are available for restoring several teeth at once or even an entire arch. 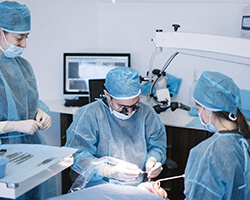 Instead of having to place one implant for every lost tooth, we can instead anchor these prosthetics over a small number of strategically angled implants – this makes the reconstructive process much more cost-effective. Depending on a patient’s personal needs, their new “teeth” can be permanently fixed in place or left removable like a traditional denture. Many general dentistry practices have to refer their patients to separate specialists for the surgical component of their dental implant procedure – but this isn’t the case here at Morgan-Hill Dental Care. Dr. Ted and Dr. Hill both have the specialty training needed to personally perform this important stage of treatment in-house, resulting in maximized convenience. We look forward to personally caring for your smile at every stage of this state-of-the-art transformation! Because of these various steps that always differ from person to person, it is difficult to provide a cost estimate without first assessing a patient’s oral health needs during an initial consultation. Here at Morgan-Hill Dental Care, we will be happy to provide a comprehensive treatment plan following this appointment that covers all of this important information in crystal-clear detail and helps you feel confident about your smile’s brighter future. Dental implants may seem like an investment at first, but the valuable, lifelong benefits they provide are well worth it.